2 years ago today, I decided that I'd build a wiki. At the time, I was unsatisfied with all the currently solutions out there - they were either too bulky, old and unmaintained, or just otherwise not quite right. I decided to build something different: An entire wiki in a single file. One single file that you can drop onto your web server and have it just work. Although I've had to rework and rewrite a few things along the way, development has generally gone ok. I've found that as it's grown, I've needed to change the way I design it slightly - it's been a great learning experience! In May this year, I managed to get Pepperminty Wiki into Awesome Self Hosted, a list of cool pieces of software that you can host on your own server - a list that has ~12,000 stars on GitHub. Fast forward to the present, and I find myself with an awesome wiki - that's still all contained in a single file. It's powered by Parsedown. It supports multiple users, page protection, sub pages, full text search (! ), customisable themes, tags, redirects, and more! It's also got a whole host of configurable settings system - allowing you to customise how your wiki works to your liking. Best of all, it's got a flexible module based system - so anyone can come along and write a new module to extend it's functionality. If this sounds like the kind of thing you'd like to use yourself, just head over to the getting your own copy section on it's page (for the lazy, the online downloader is here). I've had automatic tweeting about blog posts I put up on here for ages now. I've also had a mailing list set up for a while too. Today it occurred to me that not everyone uses twitter or wants an email, and so I've just set up a few more automatic reposting systems (thanks to IFTTT!). If you know me through facebook, I've set it up to post about my blog posts on my timeline. If you use reddit, then I've set up a new subreddit that IFTTT will automatically post links to my new blog posts in. I'm still tweaking and perfecting the new systems - please comment if you notice anything that's off or could be improved. Also, let me know if there's a channel that I haven't covered that you'd like me to set up. I now have a public website status page! Just recently Uptime Robot (the awesome service that I use to monitor my server's uptime) have released a new feature: Public status pages! Status pages appear to be free (for now), so I've gone and set one up. Now all of you can see what's up with my website if it's down. They even allow you to point a (sub)domain at it too. I did this too, so you can visit my status page at status.starbeamrainbowlabs.com. The upgrade is complete! I've managed to move practically everything over to the new server, apart from a few automated cleanup tasks here and there. There are still a few issues floating around, but they shouldn't affect this website, and I should have them cleared up soon. Although the migration went smoother than I expected, I did encounter some issues and learnt a few things that I thought I'd share here. The first thing I found was that starting a todo list isn't a rather good idea. It sounds simple, but it's actually really useful. I found that I had a lot of small tasks I needed to complete, and I kept thinking of more things that needed doing at regular intervals. If I didn't write them down I'd never get anything done because I'd never be able to remember what needed doing first! It also helps to do your research before you move. Make sure that you're properly reaquainted with all the software running on the system that you're going to migrate from, and that you're familiar with all the ins and outs of your particular situation. If you aren't, then you risk stumbling across some rather nasty, complicated, and time consuming problems mid-migration. It also helps to do as much of the migration as possible without taking the old system offline. Install the software, Move the configuration files. Set up the firewall. Set up your new monitoring tools. This allows you to minimise the downtime that you have to subject your users to, which is always a good thing. Lastly, testing is incredibly important. test everything. Make sure that every little feature after you migrate. You'd be surprised at how many issues can crop up after migration. I've been watching Kimsufi's server page for what feels like absolutely ages now, waiting to get my hands on an ultra-cheap €4.99 per month (excluding VAT of course) KS-1 dedicated server. Unfortunately I've never been quite fast enough, so yesterday I decided that enough was enough and went ahead and bought a KS-2B at €9.99 per month (again excluding VAT). After all is said and done it works out to about £8.39 per month, which, for 2 cores / 4 threads, 4GB RAM, and a 40GB SSD, is an absolute bargain in my eyes. I've been busy moving things across and it's going well, but I haven't finished yet - I still have the web server and the mail server to set up. I'm also looking at using the Hiawatha webserver instead of Nginx. Hiawatha is a security-first and easy to configure web server. Apparently it's also lightweight, but we'll see about that...! Nginx's config files have been annoying me for a while now, so I think that it's high time I tried something different. Pepperminty Wiki is now on WikiMatrix! After a year of waiting (and hard work improving it), Pepperminty Wiki is now on WikiMatrix.org! WikiMatrix is a brilliant site that lets you compare many different pieces of wiki software with each other in order to figure out which one best meets your needs. Unfortunately, the admins are rather difficult to get hold of, and so new wikis get added rarely. 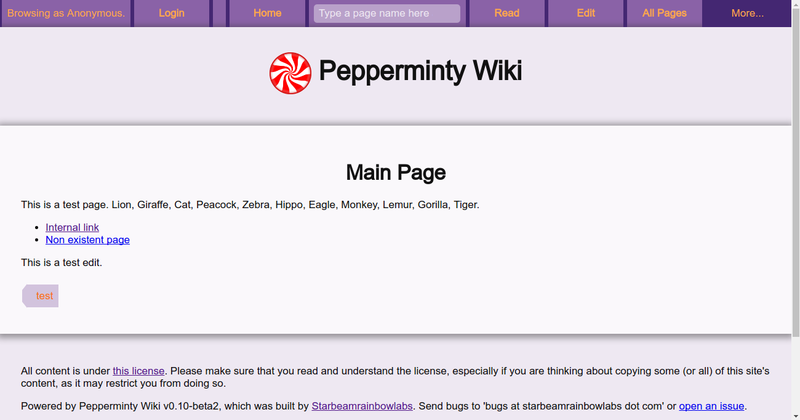 If you're looking to set up a a small wiki, I recommend checking out my project Pepperminty Wiki. It's inspired by am2064's Minty Wiki that he posted on /r/tinycode, and is designed to be uploaded to a web server and just work (after configuring it, of course!). It's packed into a single file and currently weighs in at ~160kb, so you won't have to wait around for ages for it to download or unpack. Notable features include multiple users, subpages, templates, file uploads, a full text search engine, page protection, and more! New features are being added all the time - an up to date list can be found in the Github README (link below). Features can be added or removed at any time, too - Pepperminty Wiki sports a module based approach, letting you decide on what features your wiki has enabled. I've already created something on there - I'll be blogging about that soon. Right now though I'm rather ill though, so please don't be disappointed if I don't post right away (although I'll certainly try to get it out asap). Here's a link to my Codepen profile page. The other day I was asked by someone to add some share buttons to my blog. After taking a little look into it, I found that it really wasn't that difficult to do. Now you'll find three share buttons at the bottom of each post. To start with I picked Twitter, Facebook and Evernote, but if you would like to see any other services just leave a comment down below. Simply replace <url> with your url, <text> with your text, and <via> with your twitter handle (without the @ sign). Don't forget to run everything through rawurlencode() though, otherwise some special character might sneak through and break the link. That's all for now! Here's a list of all the posts that I've made so far in this series. Hello again - Today's post is a public service announcement instead of the usual ES6 post. Hopefully that will be coming out on Thursday. This website is now powered by a new piece of web server software: Nginx (pronounced engine-x). Ever since I started this website, I have been using lighttpd. While lighttpd has been my favourite web server software for ages (mainly because of the flexible configuration file syntax, the light footprint, and the speed), it seems that development of lighttpd's core codebase has been moving too slowly for me. Lighttpd, while fast and light, has been missing several features that I would rather like to have - and no release date for the next has been announced yet either. Nginx, on the other hand, is much more feature-complete. It will support HTTP/2 by the end of 2015, and has a slew of other features to play around with. While, it's configuration files are kind of a pain (it only matches against one location block per request), I feel that Nginx is a better solution for this website in the long run. If development resumes on lighttpd, perhaps I will move back to it - but only if I am sure that development will actually continue. So the switch has been made! Please notify me if you notice any issues and/or problems with the new setup and I will fix them as soon as I can.